Getting the nursery ready is one of the most exciting bits of preparation you will do for your expanding family. Often rooms are transformed from unloved spare rooms or drab offices into a wonderful space for precious new arrivals, and the preparation of baby’s room is what makes the whole thing seem real for many parents to be. There are plenty of guides available as to what furniture you need, and how many tiny outfits you should pack into the nursery wardrobe. But what if you have decided to keep the gender of your baby a surprise? How will you know what to buy and which colour schemes to go for? 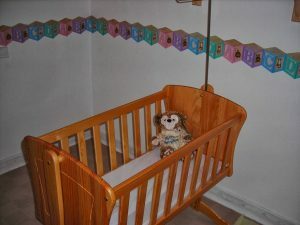 Here are a few tips for putting a nursery together that both boys and girls will feel at home in. When it comes to colour schemes keep it simple. White, cream, beige or a pastel green are great as a neutral base. Whatever the books may tell you though, yellow is not neutral, it is quite feminine in pastel shades and certainly in clothes will make any newborn look jaundice, so stay away from this palate on the walls and sheets too. If you want to be a little more creative, then a jungle, teddy bear, farmyard animal or alphabet theme in murals around the walls will work well for either gender and look super cute too. The walls can be changed when your little one starts to develop their own personality and begins to grow up, so don’t panic that this is a forever decision. Furniture is a little more permanent, and if you plan to keep it for a good few years, go for wood or white tones. Just remember, it is highly unlikely that your baby will hold the colour of their nursery walls against you for the rest of your life, so have a little fun and get pleasure from your décor choices! Toys are one thing you are likely to want to buy for baby. Newborns are showered with gifts, but 9 times out of 10 these gifts are clothes or teddies. Invest in a few toys for the nursery that baby will love as he grows. There are many toys for babies that are for neither boys nor girls and are equally loved by both. These tend to be in primary colours and aimed at child development. Examples include building blocks, stacking cups and shape sorters like the Laugh & Learn Cookie Shape Surprise. Getting the nursery perfect for your little one’s arrival can feel like the biggest responsibility in the world, but remember that it should be one of the fun and exciting bits of preparation. Everything can be changed if needs be and your baby will only know that they are warm and loved. Everything else is just decoration! The Funny Things My Kids Say - My Foot Is Starving!